Results of a Kansas City Incentives Study, which sought to complete a comprehensive data-driven analysis of the City of Kansas City’s historic use of economic development incentives and the resulting outcomes, were released this month with a key finding indicating that each City of Kansas City, Missouri’s incentive dollar invested generated $3.83 in additional tax revenue. The study was conducted by a team lead by the Council of Development Finance Agencies (CDFA). CDFA brought together five partners to complete the study including Business Development Advisors, PGAV Planners, Regional Economic Models, Inc. (REMI), and locally based Phillips-West Communications, and Bennie L. Lewis & Associates. EDCKC President and CEO Bob Langenkamp and statutory agency incentive program administrators Heather Brown (TIF), and David Macoubrie (PIEA) assisted with selection of the consulting team and served in an advisory capacity throughout the project. A study of this depth covering such an extensive period of time has not previously been attempted in Kansas City. 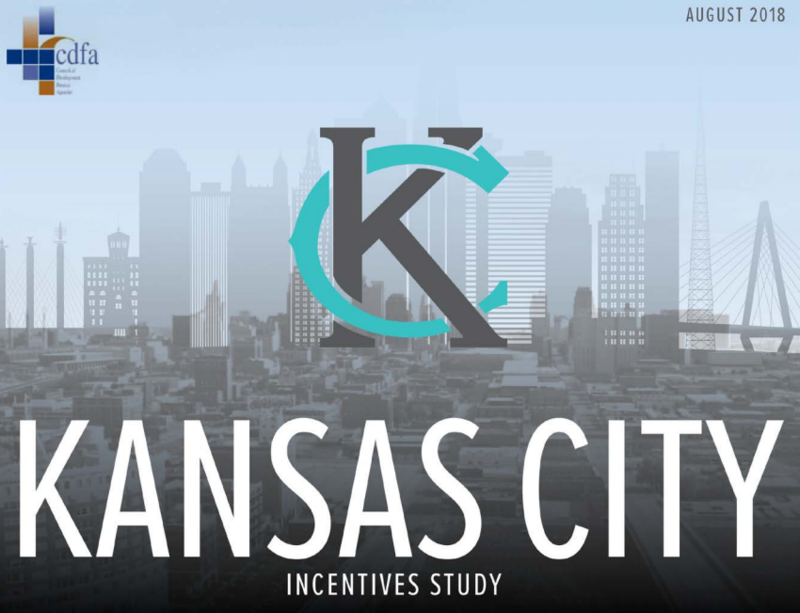 Kansas City is among a select group of cities undertaking the challenging process of conducting a historical analysis of its incentives use and striving to improve program effectiveness. The study focused on a time period – 2006 to 2015 – that had sufficient reliable data available across all programs and taxing jurisdictions and generated its results in the aggregate, rather than on a project-by-project basis, as doing so produced the best statistical outcomes. An average of 23,430 jobs across all industries were created. Per capita income increased an average $3,906. Total personal income increased an average $2.29 billion. Total business sales increased an average $4.75 billion. Economic activity (GCP) increased an average of approximately $2.66 billion. Some important information – such as the return on individual incented projects or what development might have occurred absent an incented project – could not be tracked for this study due to the availability and /or quality of data that could be sourced. Now with a baseline master set of incentive data, the City can develop new systems and procedures supporting a more detailed analytical model. In its engagement, CDFA was charged with independently designing, conducting and delivering original research, results and data-driven analysis of the City’s use of incentives. 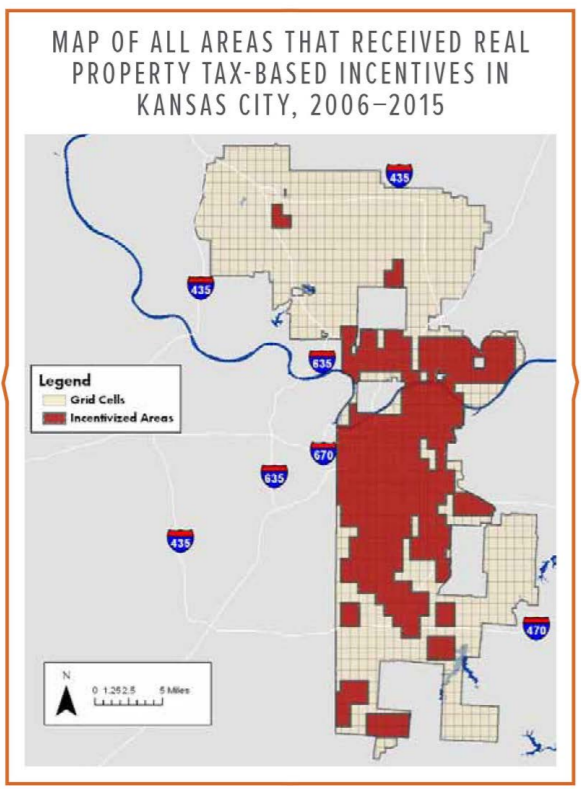 In its methodology, CDFA used AdvanceKC as the basis for policies and metrics; federal sources for regional and national historic economic data; EDCKC, the City of Kansas City, Missouri, as well as Jackson, Platte and Clay counties for local incentive program data. Economic indicators used to measure the City’s economic development progress included changes in employment, compensation, personal income, industry output (sales), gross city product (net value of goods sold), population and fiscal impacts. Geographically, indicators were organized into a digital database to show areas of the City that received incentivized investment. The indicators used included real property taxes paid, real property taxes abated, TIF incremental real property taxes paid, infrastructure projects, building permits and service calls related to neighborhood physical blight. Quantifying the outcomes of incentive programs is not easy for most cities, including Kansas City, because the data that was historically collected wasn’t always focused around reporting long-term outcomes. Kansas City has already taken important steps to improve its data collection, including undertaking this study. As a result, Kansas City has identified several opportunities to build on prior efforts and further enhance its data collection, data management and data reporting systems. EDCKC staff will play a critical role in working with the City of Kansas City to implement these process improvements in the upcoming months. The study identified five next steps for improving our incentives management system. Modify application forms and reports submitted by recipients to ensure clearly and consistently defined outcome measures. Continuously update the master data set created as part of this study using city and county sources. Incorporate jobs and investment reporting on actual outcomes achieved by active projects separately from recently approved projects and their expected outcomes in reports. This distinction should be clear to audiences. Incorporate data on incentive outcomes into KC Stat. Work with community and stakeholder groups to select additional indicators of interest including Triple Bottom Line or equitable development objectives.